My name is Monojit Saha. I am a photo-journalist in kolkata. 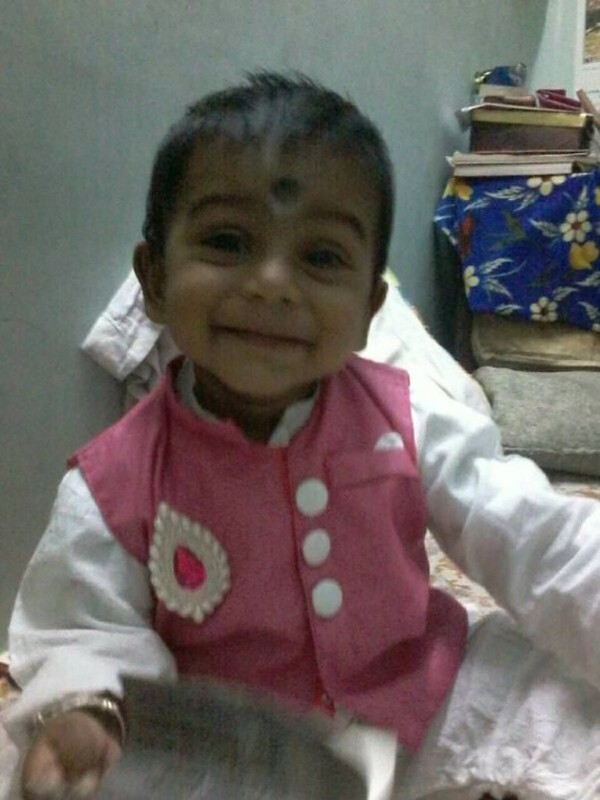 My son Avighna was 1 yr 4 months old when he started vomitting and was having problems while urinating. My wife and I took him to a doctor for check up where the doctor said he's dehydrated. 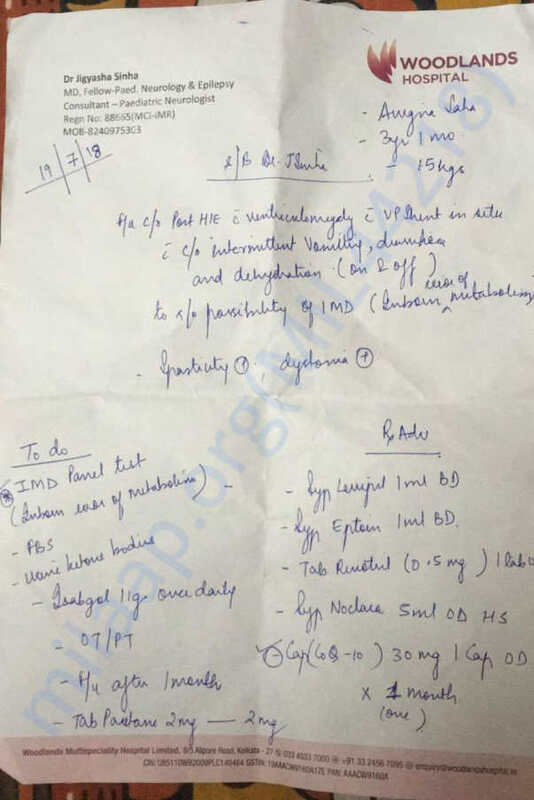 He was admitted in Park Clinic, Kolkata. 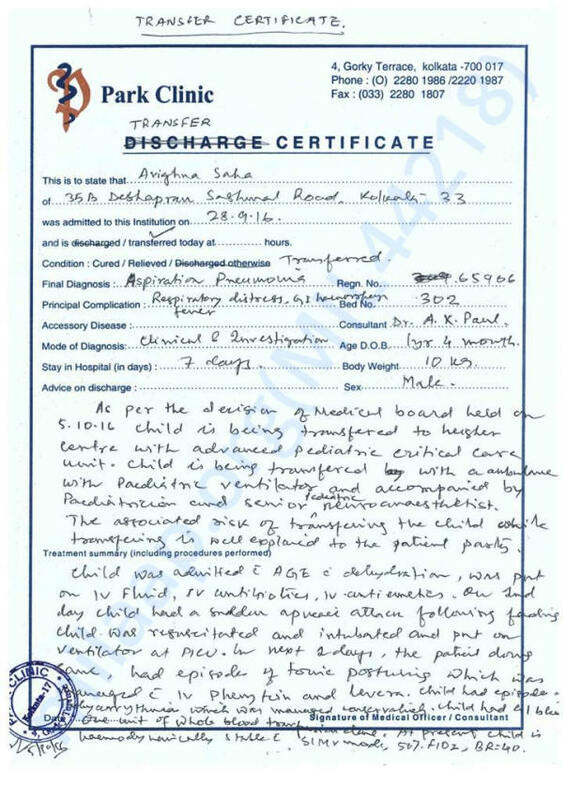 The afternoon before the discharge date, Avinghna was given a wrong injection(KCl- potassium chloride) by a trainee nurse in the hospital because of which he immediately got a cardiac arrest. 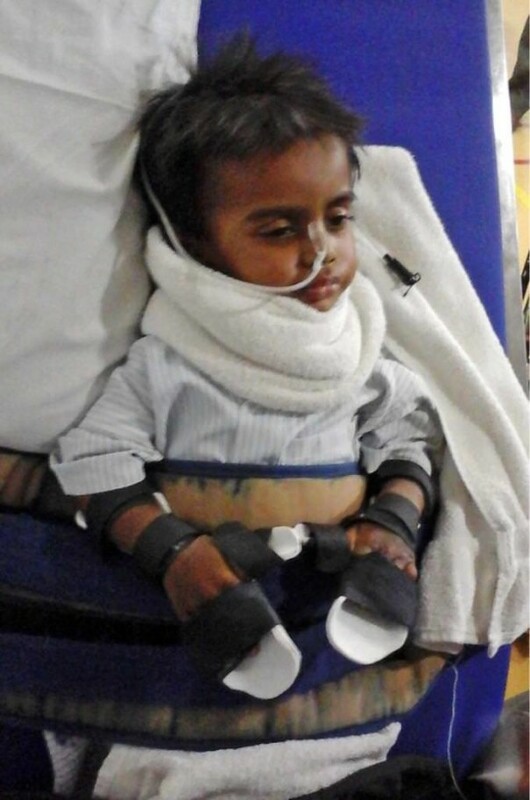 During this, blood did not flow to a part of the brain and now 80% of his brain is damaged. He was on ventilation for 19 days post this. We took him to another hospital after he was off ventialtor for check ups. After a few months, there was water accumulation in his brain. A surgery was done to remove this water and a programable shaunt has been put in his brain. My son is now 3 yrs old and completely bed ridden. He is not able to play or talk and stares into the void most of the time. We have consulted every possible doctor we could but no one has been able to cure him. They all have said that since major part of her brain is damaged, there is no such cure for it. 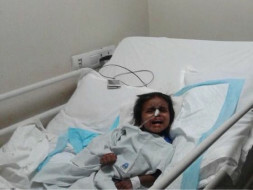 He will need livelong support of medications, physiotherapy and speech therapy. Every month I spend close to Rs 22000 for this. Few friends and relatives have helped us in the past but we still have spent close to 18-20 lakhs. Now I am finding it difficult to bear this prolonged cost. Please contribute and help me keep my son alive. 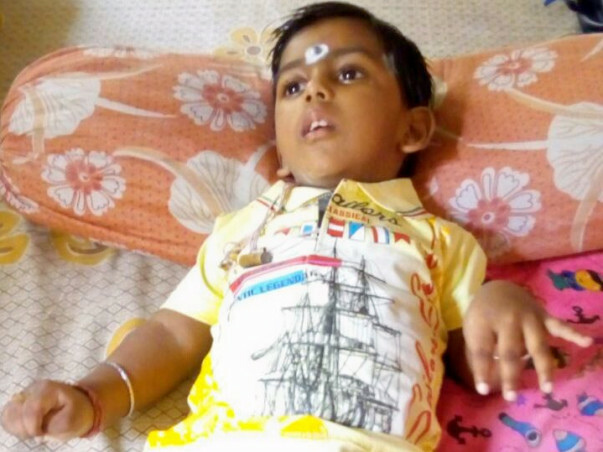 Avighna was admitted twice in one month at Institute of Child Health(ICH) for vomiting and pancreatitis,so his physiotherapy and speech therapy temporarily was on hold.Now he has been released with medication and suggested for check up with Dr.J Sinha for his neurological part. Please pray to little Avighna. 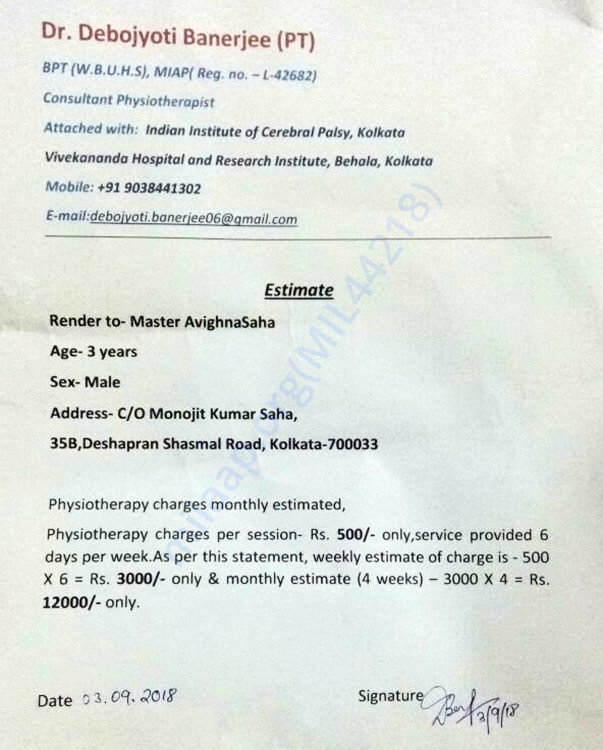 With all your blessings, Avighna's physiotherapy and speech therapy is being continued along with special physiotherapist being introduced as per doctor's advice.Coming month I will be visted Dr.J Sinha for his check up and ask her updated suggestion for the further betterment. With all your blessings, Avighna's physiotherapy and speech therapy is being continued as per doctor's advice.Recently visited Dr.J Sinha for check up and doctor suggested another specialist physiotherapist for the further betterment and I introduced him from last two week for the treatment .